While Tim Miles prepares his Nebraska team to play in the NIT, his replacement may already be lined up. Miles, in his seventh season with the Huskers, has long been on the hot seat. Expectations were high entering the season, but the Huskers, in a season besieged by injuries, went just 6-14 in Big Ten play, finishing 13th out of 14 teams. The team entered the Big Ten tournament with just six healthy scholarship players, but managed to pull out two wins, including an upset of Maryland, before losing to Purdue in the quarterfinals. Those wins helped Nebraska earn an invitation to the NIT, and the team is set to host Butler on Wednesday night. The Huskers have not reached the NCAA tournament since the 2013-14 season, Miles’ second in Lincoln. The team even missed out on the Big Dance last year despite a 13-5 conference record. Miles was given a one-year extension after the season — before Moos was brought in from Washington State. Not long after his arrival, Moos fired Mike Riley — after letting him finish out the season — and confidently brought in Scott Frost, a former Nebraska quarterback, from UCF to coach the Huskers’ underperforming football program. At Washington State, Moos infamously traveled to Key West, Florida, to court Mike Leach even while Paul Wulff was coaching out the 2011 season. 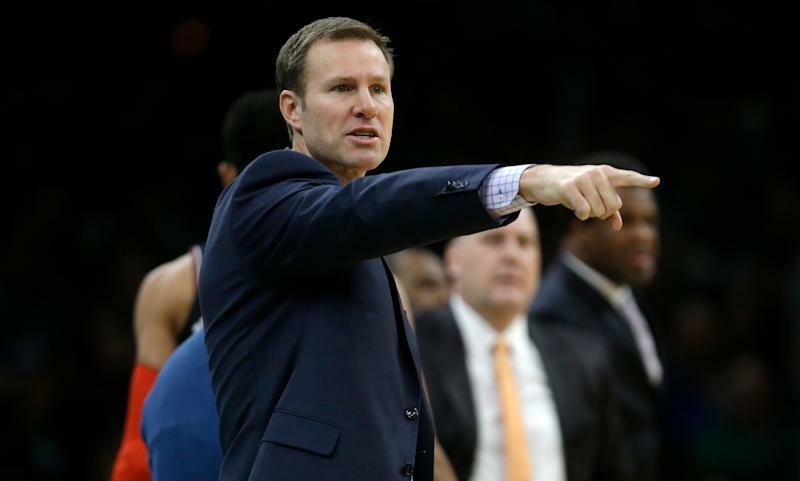 Could he be following a familiar path in pursuing Hoiberg? Hoiberg played 10 seasons in the NBA and spent several years in the front office of the Minnesota Timberwolves before entering the world of coaching. He was hired by his alma mater, Iowa State, in 2010, and coached the Cyclones to four NCAA tournaments, including a trip to the Sweet 16, in five seasons. In 2015, Hoiberg was plucked out of Ames by the Chicago Bulls. His tenure in Chicago lasted only three full seasons. After a 5-19 start, Hoiberg was fired in December. Hoiberg, 46, told ESPN in January that he wanted to continue coaching and did not have a preference between the NBA and college. Would Fred Hoiberg be a fit at Nebraska? Hoiberg was linked to a potential return to the Timberwolves in January. His name has also been connected to the opening at UCLA, but he has some connections to Nebraska. Nebraska is a school without much success in men’s basketball, but it has made significant investments into the sport since its move to the Big Ten, headlined by new Pinnacle Bank Arena, which held its first Huskers game in 2013. However, the team has struggled to move into the top half of the conference, perhaps the toughest in the nation, under Miles. Could a high-profile hire like Hoiberg — if it comes to fruition — get the program operating at a more prominent level? Without a fertile recruiting landscape near Lincoln to pluck highly rated prospects from, Miles has relied on transfers throughout his tenure to keep the Huskers at a level of competitiveness. Hoiberg, who happens to have been born in Lincoln, Nebraska, was known for the same at Iowa State. And it was a recipe that worked. He had a 115-56 record in Ames and coached the Cyclones to two Big 12 tournament championships. Perhaps he could coach Nebraska to a similar level of success.